The greenhouse gases (GHG) in the waste category are the on-site emissions from disposal of solid waste, as well as waste or wastewater treatment. A major source of the GHG from landfill comes from the decomposition of organic waste. (1) Organic waste in landfills produces methane. This is because the waste is covered in the landfill. Once covered, the organic material decomposes anaerobically (i.e. without oxygen). This produces methane. Methane has 25 times the Global Warming Potential (GWP) of carbon dioxide (CO2). If you compost, the organic waste produces CO2. However, a promising development has occurred. 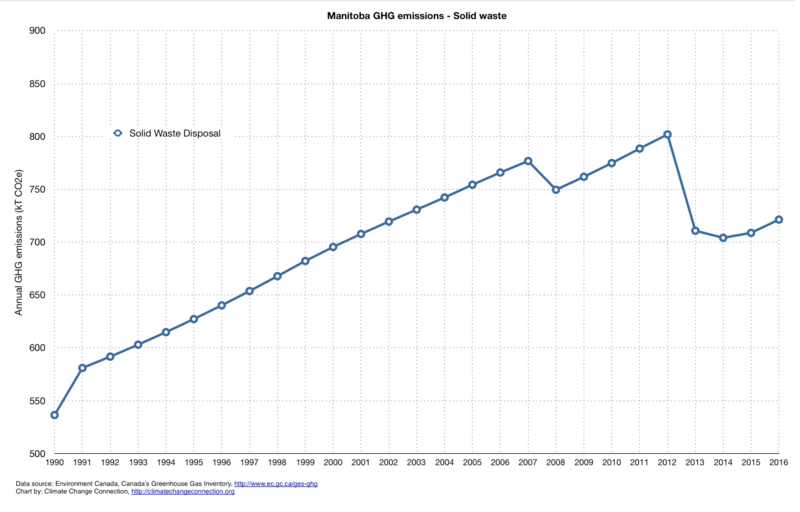 The Province of Manitoba and the City of Winnipeg put a capping system over the Brady Landfill. Since August 2013, this system has been trapping the gases that would have escaped due to the decomposition of organic matter in the dump. The methane is being “flared” or burned off. Flaring changes the methane to CO2. This reduces the global warming by a factor of 25.